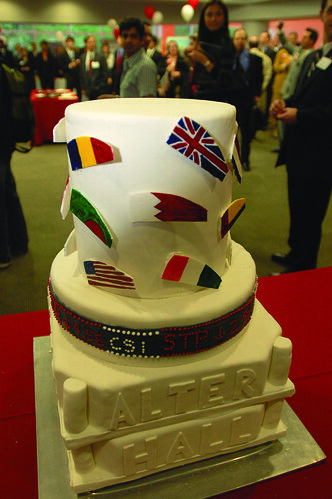 The event featured cake and confetti as part of Alter Hall’s official welcome to Main Campus (Julia Wilkinson/TTN). Confetti rained in the lobby of Alter Hall as a crowd burst into applause yesterday when the ribbon was officially cut on the new, $80 million home of the Fox School of Business. The day was packed with guided tours, a student exhibit fair and a ribbon-cutting ceremony at the 217,000 square-foot building located on the corner of Montgomery Avenue and Liacouras Walk. The ribbon-cutting ceremony was hosted by Steve Cordasco, a Fox School of Business alumnus and member of the Fox Board of Visitors, and host of Big Money on Big Talker 1210 AM. “The opening of Alter Hall is nothing less than a transformational event in the history of the university and the Fox School of Business, and today, we celebrate our collective achievement with individuals who played pivotal roles in bringing about this building,” Cordasco said. Speakers included Fox School of Business Dean M. Moshe Porat, President Ann Weaver Hart, Board of Trustees Chairman Daniel Polett, Trustee and Fox Board of Visitors Chairman Richard Fox, men’s basketball coach Fran Dunphy and the building’s namesake, Dennis Alter. Alter, who graduated from Temple in 1966 and serves as a member of the Fox Board of Visitors, is also chairman and CEO of Advanta Corporation. He and his wife, Gisela Alter, donated more than $15 million for the construction of the building. “I first joined Temple University when this was a dirt lot, and there was a wonderful, hopeful sign – ‘The future home of the Dennis and Gisela Alter building for the Fox School of Business and Management,’” Hart said. “And it’s here, and when I look back at that wonderful, wonderful hole in the ground that came next, it’s hard to imagine that this was only two years ago when we put a shovel in the ground. The state-of-the-art facility contains more than 200 pieces of art by local artists, a 177-foot elliptical ticker – the longest at a U.S. business school, – an indoor mural by the Philadelphia Mural Arts Program, a kinetic flag sculpture and a 6,400-pound revolving stone-and-water globe sculpture, in addition to several smart classrooms and abounding technology. “The vision of the Fox School is to become the best public urban business school in the country and to be ranked among the best business schools in the world,” Porat said. “I know that it will take some more work to make it happen, but Alter Hall will certainly be an enabler in achieving this vision. Alter Hall represents a historic transformation that will affect students, faculty, staff and alumni for generations. [It] is one of the most sophisticated business school facilities in the nation. Alter, the closing speaker, gave a humble and humorous speech. “It’s daunting, a little embarrassing, to sit up here and have all of you say so many kind things about me and what we’ve tried to do. I’m a little overwhelmed. But if you could, run through that one more time,” Alter joked. Alter told the audience several personal anecdotes about his educational experience at Temple in an attempt to explain why he and his wife chose to donate $15 million to the construction of the building. The Board of Trustees met on Tuesday where it elected a new member and approved funding for various on-campus construction and renovation projects. A guide to some of Temple’s biggest players and their words of advice to incoming students. You did a great job covering the Alter Hall Opening Celebration. Thanks for coming. It was a great day for the Fox School. Whatever you do, please do not get Advanta Bank credit card. They will charge you 37% interest rate on Advanta credit card within six months. I can give you thousands of reasons why this credit card company should be closed down. By most accounts, Advanta will unlikely to survive beyond 2010. Please do your homework about Advanta. Do google search for 5 minutes. You will have more than enough information about this company and Advanta CEO Dennis Alter, the Scumbag. I will second that on Alter, he has driven stock in Advanta to a penny stock (a couple of years ago, it traded at close to $30) , while raising interest rates to SMALL BUSINESSES to rates as high as 37%-for not other reason than ‘we can’-although, now the FDIC and FTC have investigated it and have determined that Advanta could NOT do this, and Advanta was hit with an agreement to refund the overages to CC holders. Alter is a greedy user who steals from hard-working and honest small business owners-false piety from Alter is laughable, but stock holders and Credit Card holders will eventually get the last laugh on Alter-a mini-Madoff. Dennis Alter is President & CEO of Advanta, which is one of the largest creditors for small business. Right now he is breaking the backs of his credit customers, charging over 37% interest on some accounts, when individuals can least afford it. They are losing their businesses & livihood while Mr. Alter overcharges them & sends their accounts to collections. It is no wonder that Mr. Alter can give money away, but he should not in any manner pretend to have earned it or be recognized for it when he is being so very abusive to others. I am sure his father Jack would never have allowed such abuse. The company was founded to help teachers who could not otherwise establish credit through the banks. Advanta credit policies are neither appropriate or moral, Dennis Alter. You do not rob & punish others who can not pay their bills & then stroke your ego for publicity & recognition. You may be able to purchase your awards through Temple & other charitable organizations, but you will never be able to repay the individuals you have harmed & continue to harm. Hey, Temple University. Guess what – those donations that Dennis Alter has been providing are being funded by people who are being ripped off by Alter! move, Dennis. How did that work for you? Once people lose everything they have Dennis – you don’t beat them down for more. Oh – excuse me, yes YOU do. Dennis Alter, you have abused your Advanta Management position by taking financial advantage of your customers at a time they can least afford it. A 37% interest rate is beyond excessive & moral reason. And I am sure you know in your heart, your father Jack would not approve of such abuse. August, 2005, “Philadelphia Magazine” named Dennis Alter “Best Business Leader”. Their address is 1818 Market Street, 36th Floor, Philadelphia, PA 19103, call 215-564-7700, or email Michael Callahan at mcallahan@phillymag.com. And, in 2000, “Fortune Magazine” named Advanta one of the “Most Admired Companies in America”. A recent article posted on CNNmoney.com notes Advanta as: “The credit card company everybody hates”. Their address is 1271 Avenue of the Americas, New York, NY 10020-1393, phone 212-522-1212, Fax is 212-522-0390, http://www.fortune.com. All the individuals & business owners who have suffered financial abuse at the hands of Dennis Alter’s Advanta Corporation might want to respond with their own stories. many wonderful “titles” are bestowed upon you, your true walk is the one you walk everyday. Your company policies have hurt and betrayed hundreds of thousands. I know I have to find a way to forgive you, for the suffering you have caused my family, Mr. Alter. But I do not have to respect you. I didn’t default. I was never late but suffered under a rate hike to over 30%. This week I make my final payment to this greedy crooked piece of scum. No adwards that he buys with my money will ever stop my quest to bring this man down. Dennis Alter you are evil. Normally I’m against kiinllg but this article slaughtered my ignorance.